I bought a magnetic drive pump (I think) some years ago to go with my 3 vessel system I'd bought & never got around to even trying it out. As I'm now planning to set up the system I've started wondering what exactly I bought. I think it is a reconditioned March pump, does anyone have an idea which, or what it is? Also, the power fitting - anyone know how I'd connect that up to a power supply or simple on/off/variable speed switch? 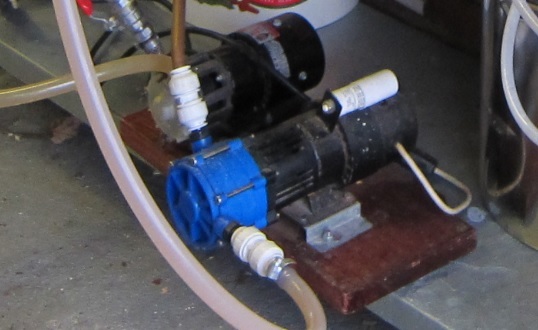 Re: Anyone recognise this pump? It looks very similar to my March May MMP3 pump. Thanks Mark, yes it does. That'll help me in a search for instructions. How is yours powered, if I may ask? Its a standard 240V pump, live neutral and earth.